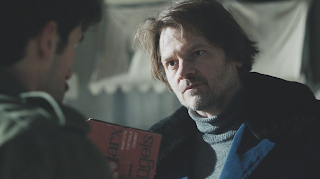 Has Slavoj Zizek written about Comrade Detective yet? It seems to be the perfect show for him, not just for its setting behind the iron curtain, but its central premise is that of a "subject supposed to believe." Comrade Detective is a show streaming on Amazon. Its central premise, or gag, is that it is ersatz Soviet Bloc propaganda. The show is made to look as if it is a Romanian detective show from the nineteen-eighties; it is shot with Romanian actors (but modern production values) the dialogue is then dubbed by actors such as Channing Tatum and Joseph Gordon-Levitt.